Due diligence should be risk-based and tailored to match the product or service provided by a third party. It’s important to do initial due diligence prior to signing a contract and then ongoing due diligence during the course of the relationship. 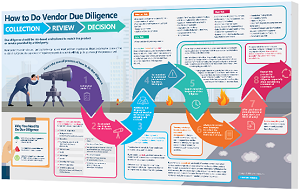 Download this guide to help you through the vendor due diligence process.